The drink driving penalty calculator below will give you a reliable estimate as to what sentence you can expect to receive upon conviction of driving or attempting to drive a motor vehicle on a road or other public place after consuming so much alcohol that the proportion of it in your breath, blood or urine exceeds the prescribed maximum legal limit (Section 5(1)(a), Road Traffic Act 1988). Please Note: The penalty calculator is only applicable to sentences handed down in Magistrates' Court in England and Wales. The penalties are based upon the guidelines Magistrates' follow when convicting people of driving with excess alcohol in England and Wales. 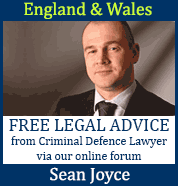 Scotland has different legal limits and no sentencing guidelines. If you are facing a drink driving charge in Scotland, you can get free legal advice here or contact a solicitor based in Scotland here. What was your alcohol reading? When answering the above question, do not include interim disqualifications, disqualifications where vehicle was used for the purpose of committing crime or disqualifications for taking a vehicle without consent or going equipped to take or steal a vehicle. The drink driving penalty calculator above provides a reliable estimation of what sentence you can expect to receive upon conviction of drink driving at Magistrates' Court in England and Wales. The penalties are laid out in the Magistrates' Court Sentencing Guidelines, provided by The Sentencing Council for England and Wales. Magistrates' consult these guidelines when sentencing drink drivers, however they do have the discretion to deviate from the guidelines where there is evidence of extreme and/or multiple mitigating or aggravating factors surrounding a particular case (e.g. a serious road traffic collision). The Magistrates' Court have the discretion to disqualify convicted drink drivers until a relevant driving test is passed. If they choose to disqualify until a test is passed, in the case of disqualification upon conviction of driving with excess alcohol, it will be the extended test a driver will have to pass to regain their driving licence. Magistrates' are likely to exercise their discretion to order a disqualification until a driver has re-taken their test where their is evidence of inexperience, incompetence or infirmity or the disqualification period is lengthy and the offender is going to be 'off the road' for a considerable length of time. Guide to appearing at magistrates court for drink driving offences.